Niagara County Peach Queen Maggie Dorian, left, and Smelt King Ken Scibetta served some of the fried creatures at a recent Smelt Festival in Lewiston. LEWISTON – There is one more Friday fish fry to put on your calendar – the Lewiston Smelt Festival from 6 to 10 p.m. Friday. 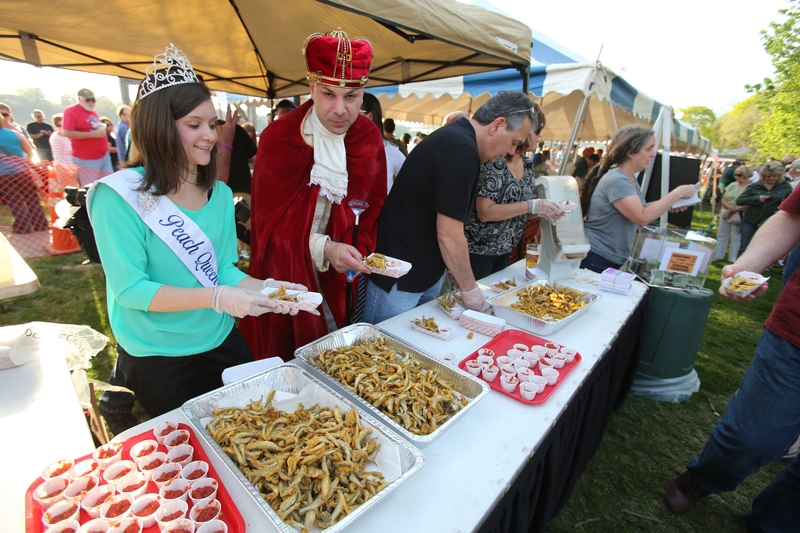 More than 400 pounds of free samples of smelt are fried up each year at the annual festival, which also offers music plus additional food and beverages at the foot of Center Street along the Lewiston waterfront. “It’s become an event that signifies the beginning of the festival season,” said Jennifer Pauly, executive director of the Niagara River Region Chamber of Commerce, which hosts the event along with the Niagara River Anglers, the Silo Restaurant and the Village of Lewiston. A donation to purchase the smelt has been provided by Chemical Waste Management. Smelt, a small fish that looks like a herring, has a mild and delicate taste after it is battered and fried up for tastings. Though smelt can be found throughout the Great Lakes, the state Department of Environmental Conservation deemed Lewiston, along the Niagara River, one of the best places to come to dip your nets when the smelt run up the river. A few members of the Niagara River Anglers began the early tradition in April of 1983. They would gather at the Lewiston sand dock, dip for some smelt and then clean them and fry them up on the spot. The event continued to grow and allowed visitors and “non-smelters” a chance to take a taste. Due to the growth of the event, the smelt are now purchased, and the date has been set as the first Friday in May each year. Paul Jackson, president of Niagara River Anglers, said his members look forward to the event. He said that although the tastings are free, his group accepts donations and holds raffles, making the Smelt Festival one of its major fundraisers, raising about $1,000 each year. The money helps the group’s education efforts for anglers, including sending kids to an outdoor camp and setting up a fishing pond for youth. “We never made any money until the village came on board. Now its a big party, a real destination,” said Jackson. “I tell people to eat them like french fries – dip them in some hot sauce or cocktail sauce and then wash ’em down with a beer. And if you don’t like them, you can go stand in line at the Silo for a hot dog,” Jackson said. The Friday night event is geared toward an adult audience and includes entertainment from the Lakeside Blues Band and an appearance by the Smelt King and his court. Beer and wine will be served, and a tent is supplied by Brett’s Tent and Awning. Portable toilets are donated by Modern Corp.
For those who can’t get enough, smelt dinners are served throughout the weekend at several Lewiston restaurants, which can be identified by a decorative fish sign outside the door, including the Silo Restaurant, Apple Granny’s and Casa Antica. Jackson said the Silo is the only restaurant that is a direct participant supporting the event. He encouraged anyone who would like to offer additional support to the recreation, conservation and education group to join the Niagara River Anglers. Memberships are $20, and for an additional $15, members are given a key to the group’s private pond on Balmer Road in Youngstown. More information is available at www.niagarariveranglers.com. For a list of the busy upcoming summer festival season in Lewiston, check out the Chamber of Commerce website at www.NiagaraRiverRegion.com.